If you never brush your teeth, eventually you’ll get cavities, your gums will recede, and your teeth will rot. You’ll also have terrible breath and nobody will want to talk to you. You won’t notice the changes after a day, a week or maybe a month, but you will notice them over time. The same is true for your domain name investing portfolio. And we’ve all been there…had an idea, bought a domain name, renewed it year after year, and never received any inquiries on it. Now multiply that scenario by 10, 100 or 1,000 domains and you’ve got a situation that’s out of control. Your hopes of investing profits have rotted away with your savings. Luckily, you found this video to get you back on track. Domain Name portfolio hygiene means reviewing the domain names you own on a regular basis and determining which ones to keep and which ones to liquidate or drop. You can do your domain portfolio hygiene review either once a year or once a month when you sign into your registrar to renew domain names, but regardless — it is necessary to do on a regular basis to maintain a healthy and profitable investment portfolio. 1. How long have you owned the domain name? 2. How many unique visitors does the domain name receive per month? 3. How many offers have you received on the domain name? Let’s start with question number 1: How long have you owned the domain name? If you’ve owned the domain name for less than six months, for example, you may not have owned it long enough to determine if it’s worth keeping because there simply may not be enough data. I always hold my newly acquired domain names for at least two to three years because I may not receive an inquiry on the domain name but once a year. And if I picked up the domain name for $350 and only once a year quote the domain name for sale at $9,000 or $10,000, I may not have enough data to refine my retail pricing strategy. I bought Catastic[. ]com a few years ago for a few hundred dollars so my daughter had — what was then — a really cool email address. It since has become less cool as she’s become a teenager, for some reason. Although I’ve owned the domain name for four years, we only receive one inquire on average per year on the domain name. It also gets traffic. But if I only held it for 12 months, there’s a chance it might not get an inquiry and I may incorrectly drop it or auction it off for wholesale value. That’s why knowing how long you’ve owned a domain name is important. It doesn’t take 5 years to figure out that a domain name is worthless. You can usually figure it out within one to two years. Question number two is: How many unique visitors does the domain name receive? If you’re not measuring your traffic, you have no idea how popular your domain name is and — as a result — you will not value it correctly. How often is someone typing that word or phrase into their browser and appending the top-level domain to see what’s there or to see if it’s available to register. What I do is track all my landing pages with Google Analytics through an app that I invested in called Efty.com. It’s really easy with Efty because all you do it enter a Google Analytics code once and Efty does all the work for you. Then I can sign into Google Analytics and see — for any time period — how many visitors type in my domain name. Now every time I receive an inquiry on a domain name, I go into Google Analytics, type in the domain name, and see what type of traffic I received in the past 1 month, 3 months and 12 months. And if traffic has risen significantly, then that’s an indicator that I need to research it further because maybe the value in the domain name has gone up significantly. A few months ago I purchased the domain name Unicorn.io because I think it’s a great brand name for a startup company. But until I added it to Efty and set up my landing page, which tracks traffic through Google Analytics, I never would have guessed it receives almost 1,000 visitors per month. As a result, I set my asking price about 40% higher than I originally anticipated doing. Zero unique visitors means nobody cares about the domain name. 10 or more unique visitors per month is pretty good. It means that people are thinking of the name and like it enough to see if anything exists or if it’s available to register. The third and final question is: How many offers have you received on the domain name? This is the most important test of a domain name’s value. Whether or not people give you an offer on the order of magnitude of the fair market value isn’t the point. I’m sure there are tons of people who want to own Important[. ]com, but they only offer me $100. That doesn’t mean the fair market value is $100, but it does mean that they like it enough to inquire and make an offer. It may take some education, or it may take some time for them to grow their business to afford the domain name. Regardless, the domain name has value and they are making an offer on it. Now I know what you’re thinking…Mike, you forgot X or Y. I’m sure there are many exceptions to these rules. 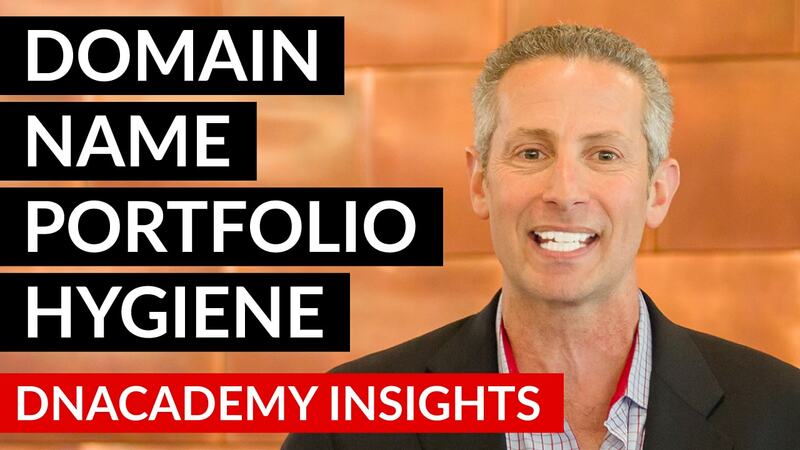 If you’re a DNAcademy student, click below for the full lesson where I share two big exceptions to these rules as well as a quick tip that many Sherpas have recommended over the years to ensure you don’t make any mistakes in your portfolio hygiene practices. (1) How many domain names have you owned for more than one year that have (2) zero traffic and (3) zero inquiries? If you don’t know, it’s time to start collecting data. If your answer is more than a year with zero traffic and zero inquiries, then it’s time for you to make some tough decisions…because those 10, 100 or 1,000 domain name renewal fees could easily go into purchasing a valuable domain name for $100, $1,000 or $10,000 dollars. And remember, it’s liberating to be able to clean house once a year. Every time I clean my garage or my closet, I always feel great about myself. So don’t be hesitant to do your own portfolio review…you’ll end up with a healthier portfolio that saves you money AND you’ll feel great about yourself for doing so. Great content in this video, Michael. Thanks for all you do and keep it up! I need track my traffic. I dont get many inquires. It is important to purge your inventory in certain cycles every year. It is part of the evaluation process of your business that you “should” be doing. Great stuff Michael.